Besides the sun, moon, and stars, there are five other prominent objects in the sky: the planets Mercury, Venus, Mars, Jupiter, and Saturn. Their complex motions mystified ancient people, and eventually motivated the development of modern astronomy. To the naked eye, each of these five planets looks like a bright star. Venus is the brightest, brighter than any star and sometimes visible in the daytime (if you know where to look). Jupiter is also brighter than any star, while Mars is quite variable, sometimes as bright as Jupiter and sometimes only a little brighter than the North Star. Mercury and Saturn are never as bright as Jupiter, but are still brighter than all but a few of the stars. 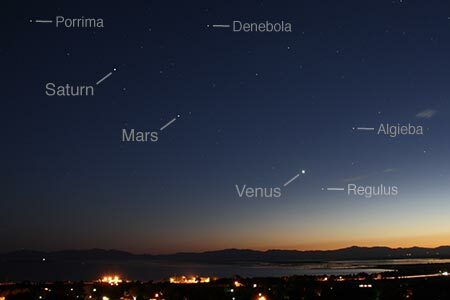 During the middle months of 2010, the planets Venus, Mars, and Saturn could be seen together in the western sky after sunset. (Mercury also joined them for a while, but was difficult to photograph from northern latitudes.) In this photo, four of the brighter stars of Leo and Virgo are also labeled. Exercise: Use the Sky Motion Applet to determine which planets are currently visible in the night sky, and at what times, and in which directions. Question: The photo above was taken on a July 2010 evening from northern Utah. Use this information and the Sky Motion Applet to reproduce this configuration of the planets with respect to the surrounding stars. On what date in July was the photo taken? Check your answer: 12 Yes! No, look at where Venus is compared to the two nearest stars. In many Western languages, the days of the week are named after the seven original "planets" (as classified by the ancient Greeks). In English, four of the names come from Germanic gods that resembled the gods that the Greeks and Romans associated with the planets. In Spanish and French, Christian influences replaced the names of Saturn and the sun. Although the planets look like stars, their motions through our sky are much more complicated. On any given day/night, they rise and set like a star would. But like the sun and moon, they gradually wander among the twelve constellations of the zodiac, always staying close to the ecliptic. In fact, the word "planet" comes from the Greek word for "wanderer", and in this sense, the sun and moon were also originally classified as planets. One vestige of this old classification is our names for the days of the week, one for each of the seven original "planets" (see table at right). Nevertheless, to avoid confusion, I'll use the word planet (in this chapter) to refer only to the five star-like wanderers, not including the sun and moon. 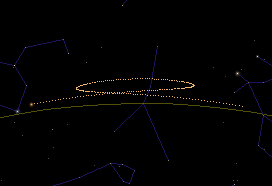 This simulated multiple-exposure image shows the looping path of Mars with respect to the stars from October 1, 2009 (at right) through June 1, 2010 (at left). The yellow line is the ecliptic. Here is a spectacular composite photo of the same motion. Besides their star-like appearance, the planets differ from the sun and moon in the details of their motions. Recall that the sun and moon both move along (or near) the ecliptic from west to east—that is, leftward if you're at a northern latitude, looking up into the southern sky. The five planets also move from west to east most of the time, but not always. Instead, they periodically slow down (with respect to the stars), stop, and reverse direction, moving from east to west. Then, after a few weeks or months, they reverse direction again, resuming the usual eastward motion. The more common eastward motion is traditionally called forward motion, while the less common westward motion is called retrograde motion. Retrograde motion is easy to observe, as long as you're somewhat familiar with the constellations and have enough patience to make observations over several nights. The retrograde motions of Mars, Jupiter, and Saturn conveniently occur when they are opposite the sun in our sky, and hence visible all night long; we then say that they're at opposition. These planets are also at their brightest when at opposition, though the brightness differences aren't nearly as great for Jupiter and Saturn as they are for Mars. The time interval between one opposition and the next is about 780 days for Mars, 399 days for Jupiter, and 378 days for Saturn. Venus and Mercury, on the other hand, are never opposite the sun in our sky. Instead they stay relatively close to the sun: Venus within about 47 degrees and Mercury within about 28 degrees. This means that these planets can be visible either in the western sky after sunset, or in the eastern sky before sunrise, but never near midnight. Mercury, in particular, is hard to observe over long periods because it is always so close to the sun. Retrograde motion, for either Mercury or Venus, occurs when the planet has been visible in our evening sky, then quickly approaches the sun (from our perspective) and later appears on its other side, in our morning sky. The planet's forward motion then gradually carries it back toward the sun from the other side, and eventually back into our evening sky. This pattern repeats about every 584 days for Venus and every 116 days for Mercury. To help you visualize these motions, I've created a Whole Sky Applet that draws the planets on a map of the entire (360-degree) sky. Please spend some time playing with this applet, watching the forward and retrograde motions of each of the five planets. Then use this applet (or the Sky Motion Applet) to answer the following questions. Question: Observe the forward and retrograde motions of Jupiter. About how long does each period of retrograde motion last? Three weeks No, watch it again, carefully! Two months No, watch it again, carefully! Six months No, watch it again, carefully! Question: As shown above, Mars was in the constellation Cancer during its retrograde motion in late 2009 and early 2010. Which constellation will Mars be in during most of its next retrograde motion, in early 2012? Check your answer: LEO Yep! No, check again. The intricate motions of the planets were a wonder and a mystery to ancient people who took the time to observe and ponder them. It was natural that most ancient people considered the erratically moving planets to be deities, with wills of their own. It was also natural for people to conjecture that, like the sun and the moon, the planets might have noticeable effects on our daily lives here on earth. This idea was developed into astrology, a subject that gets far more attention than astronomy even in today's newspapers and bookstores. Meanwhile, the ancient Greeks eventually attempted to devise mechanical models to explain (and predict) the complex motions of the planets. These efforts are described in the following chapter. Copyright ©2010-2011 Daniel V. Schroeder. Some rights reserved.